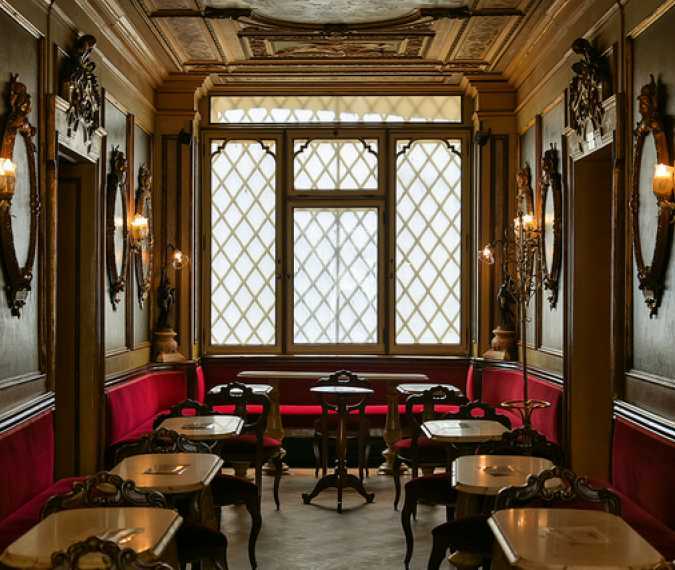 If you’re planning to travel in Venice or you are already there, you have to go for a coffee to the Caffè Florian . Caffè Florian is a coffee house situated in the Procuratie Nuove of Piazza San Marco, Venice. It is considered the oldest Café in Europe as it was opened on 29th December 1720 by Floriano Francesconi as “Alla Venezia Trionfante” and since then it’s in continuous operation but the café was renamed Cafe Florian by the name of the first owner. Caffe Florian was the favorite coffeehouse of 19th-century intellectuals, from Kazanova to Lord Byron, from Goethe to Marcel Proust, from James Joyce to Gertrude Stein. Many of this century’s famous personalities were impressed by the magic of the Venetian coffee and expressed their enthusiasm in paintings and in many literary works, such as novel Roderick Hudson (1875) and "Other Memories "(Further Reminiscences, 1889) by the English novelist Anthony Trollope (1815-1882).Also, many artists, such as Canaletto (1697-1768) and Giuseppe Bertini (1825-1898), painted Cafe Florian. It is a symbol of Venice for 300 years. It is one of the oldest and most historical cafes of Italy along with Cafe Greco in Rome and Cafe Quadri, which is also found in Saint Mark's Square in Venice. Concerning the interior decoration at Cafe Florian , his owner instructed the artist Ludovico Cadorin to reform his coffee in the so-called French rhythm of Pompadour and in 1858 it was reopened with luxurious halls, allegorical paintings on the walls, and large golden mirrors, red velvet sofas and marble tables and Murano crockery. The first international art exhibition was held there in 1895 and it’s world known as the Venice Biennale. Creating an art exhibition was an idea of these years’mayor Riccardo Selvatico so as to pay homage to King Umberto I and Queen Margherita. But Caffe Florian is also pioneering introducing in the early 20th century, the traditional European “café-concert” with a permanent orchestra that today still continues this beautiful tradition.